Call of Duty is something of a phenomenon, a strange black hole that gamers throw their money into year after year. No matter how tired we get of the previous entry, there’s something that keeps us coming back to the franchise even when we swear that we’re done. It used to be the tight, focused single player mode, but that’s given way to the addictive multiplayer component. Now that Modern Warfare 2 has bruised our fragile psyche in that respect, it’s fallen to the underdog, Treyarch Studios, to breath life back into the franchise. 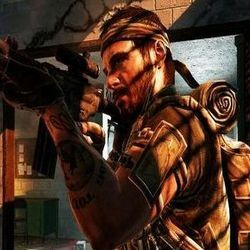 Even though Treyarch is pegged as the B-team for Call of Duty, churning out sequels in the off years, they’ve never really had a chance to strike out on their own. Seemingly forced to make games based on World War 2 after their audience had moved on, every Call of Duty that didn’t have the Modern Warfare moniker was almost destined to fail. Something different happened this time, though, and this new Call of Duty is set on the sidelines, focusing on the deadly Black Ops special forces soldiers who went behind enemy lines and did the dirty deeds no one would know about. With a new era and a new focus, does Call of Duty: Black Ops deliver the goods? When it comes to the single player story, Black Ops can proudly stand tall as the best campaign in the history of Call of Duty. While it lacks the grand set pieces of Modern Warfare 2 or the brutal cacophany of World at War, it is the most tight, well paced story ever to grace the series. For most of the game you take on the role of Alex Mason, played to perfection by Sam Worthington of Avatar fame. To say that Mr. Worthington is the stand out talent in this game would be a disservice to the rest of the cast who all do a fantastic job of making every character in the game believable. In a strange occurrence for a first person shooter game (outside of Half-Life), you may actually come to care about these soldiers by the end of the game. Ed Harris, Gary Oldman and even Ice Cube turn in great performances and their acting ties the entire package together. While I won’t go in depth with the story, given that a plot line this full of twists and turns is a veritable spoiler minefield, I will say that every level was great fun, and gave me some of the most memorable moments in any Call of Duty I’ve played. If you’ve played the game, the mention of the “boat level” may bring to mind the most perfect juxtaposition of music and gameplay done since Red Dead Redemption. In a series stuffed to the gills with cookie-cutter characters and cliched settings, Black Ops breaks the mold in every regard. As much as I loved the story, though, I have to admit that the tried and true CoD formula is getting very rote by this point. While the game does a lot to mix up the classic run and gun action, the repetitiveness of the gameplay will start to break through the veneer. Levels like the aforementioned boat run and the helicopter sections are book-ended by the monster-closet shooting galleries of previous Call of Duty entries. It’s still by no means bad (this formula has sold millions for a reason) but Black Ops still feels very much like the same Call of Duty we’ve been playing for years. It may seem like a strange complaint given the praise that I just lavished on the story line, but without the intricate tale that it weaves, Black Ops is another one-man army run through millions of faceless bullet sponges. As a thankful aside, Treyarch did tone down the ridiculous amount of grenades that the AI throws, a nice change from the tsunami in World at War. 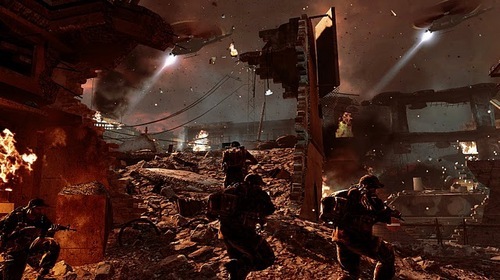 Besides the single player campaign, Black Ops also features the return of the cult classic Zombies mode from Treyarch’s previous effort. This time there are three flavors to sample from the recently revealed JFK-starring undead bonanza to a top-down shooter called Dead Ops Arcade. All the Zombie games are co-op enabled, making up for the lack of a Spec Ops option this time around. As fun as it is to hold out against the walking dead with your friends, be they time-lost World War 2 heroes or 1960s political figures, I would have liked to see the mode offered in Modern Warfare 2 make a return. 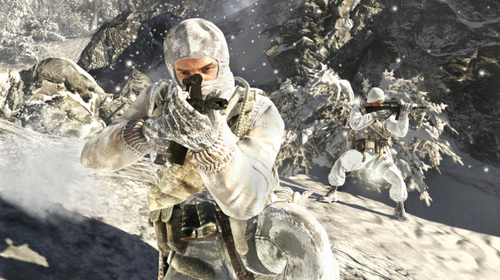 Finally, Call of Duty just wouldn’t be Call of Duty without a massive multiplayer offering to compliment the single player serving. Black Ops brings back everything you loved about Call of Duty multiplayer and adds a few new twists of its own. While the levels and unlocks made popular by CoD 4 are back, a new addition called CoD Points are introduce which functions a lot like the Credit system from Halo Reach. As you level up and complete challenges, you earn these CoD Points which are then spent on unlocking upgrades for both your character and your weapons. While the notion of ranking up to gain access to the more powerful guns is still maintained, you can purchase all the various attachments from the get-go instead of jumping through hoops to get them (provided you have the moolah, at least). Black Ops also cranks the customization of your avatar up to maximum this time, allowing you to edit the symbol on your calling card, change your in-game soldier via Perks and apply face paint. Even the little touches, like making the reticule on your reflex sight a pink smiley face, adds a lot more personality to the game and greatly enhances the sense of player investment knowing that your trooper looks like your own, instead of being the same as everyone else’s. Where Call of Duty: Black Ops stumbles on the multiplayer portion, on PC at least, is the terrible implementation of a friends system and the baffling memory leak issues that plagued the game at launch. While the latter issue has since been fixed, attempting to join your friends in a session, or even staying on the same team during matches, is nigh impossible. I acknowledge that this problem isn’t present on the PS3 or the Xbox 360 version of the game, but the lack of a functioning party system, something that even IWNet got right, is kind of unforgivable. This is where the PC version feels like a half-assed port, which is unfortunate considering that Call of Duty got its roots on the PC. While this may seem like fanboy whining, you either do something right or you don’t do it at all. For a game that has a mirror-sheen level of polish everywhere else, making playing with your friends this aggravating is an unfortunate misstep. While the reintegration of dedicated servers wins Treyarch some support, they need to implement a better friends system, and do it quick. Treyarch finally managed to do what many said they never could, which is make a strong single player campaign capped off with a refinement on Call of Duty’s lauded multiplayer. It’s no stretch to say that Black Ops has the finest single player story in the entire series, and the multiplayer is damn near perfect. If it weren’t for the poor implementation of the matchmaking on PC, Call of Duty would have earned top marks in that regard. Had I played the game on the Xbox or the PS3, I acknowledge that the issues I had with PC multiplayer would have been nonexistent, which is why I’m giving it an A. Even though the Call of Duty gameplay formula is wearing out its welcome, Black Ops is a thrilling ride that will have you fragging foes online for months to come. That’s my Black Ops review in a nut shell. I really liked the game, a lot more than I was expecting to. Have any of you played this, and what do you think? Has Treyarch topped Infinity Ward, or am I off my rocker? Go! Great review. I’m really pumped for this one now. Great review! I agree that the campaign, while short, was excellently written and very fun, and the multiplayer is surprisingly balanced, rewarding, and not frustrating. Treyarch did a damn good job with Black Ops. A is the perfect score. I can’t believe you didn’t mention anything about Wage Matches, that is quickly becoming my favorite aspect of the game. The multilayer feels almost like an updated Counter Strike, except without all the crazy snipers. I think One in the Hole is badass beyond compare, and I love being able to play Gun Game again and seeing its revival. Also, the plethora of Easter Eggs, like the console on the start screen. I really can’t wait to play this. I should be picking up my PS3 this week and I pray it doesn’t get the yellow light syndrome again as I plan to pick this up next week. Couldn’t agree more. Campaign was fun; even though I hate playing as more than one character in any game. I’m not good with names and so it did get a little confusing. Of course, Every call of Duty since (and including) CoD4 has been guilty of getting confusing lol. @ Julez. No, the Call of Duty’s are not confusing. U r dum. Troll face. Look, if you get confused, just look at which character’s face they show before the start of the mission, and read the debriefing text in the bottom right corner of the screen. Besides, 85% of the missions are as Mason. I don’t mind if a game’s story involves multiple characters. It allows the story to encompass more locations and events than one individual would be in. Halo ODST accomplished this well, and in stories involving a group of people or squad specifically, it makes the squad feel more real than if it was just a bunch of archetypes floating around a single silent protagonist. I said I’m not good with names!! But if you think MW2’s story wasn’t convoluted and confusing than Amen to your comprehension skills. I don’t really play CoD for the story, they’re largely forgettable experiences – this one being the most memorable since CoD 1. The online is really fun for a while, and that’s the key with these. I also don’t like set pieces. “Press V to struggle” “Left click to start engine”… Why not just give me the cinematic so I can keep eating my pizza pocket (lol)?? @Julez, I thought those were weird to. The button-mashing sequences weren’t very consistent. Again, probably the consequence of a PC port. At this point, getting triple A titles on the PC is starting to feel like a charity thing as opposed to an obligation. @El Kibblez, Can’t believe I forgot Wager Matches! Shamefully, I haven’t played on yet, but I’ve heard they’re the bee’s knees. Spot-on review. I was asking myself what I was thinking buying yet another Call of Duty title from the moment I left the store, but the campaign hit all the sweet spots and managed to keep things moving just enough to avoid repetitive slog scenarios. My only real beef, aside from a couple of unnecessarily ambiguous objectives, is the infinitely respawning enemies that take up the exact same position as their fallen comrades. Pretty sure that’s going to kill a Veteran run for me. I feel that the weapons are less fun in BO, and the graphics are worse. In addition I thought 4 player split-screen multiplayer was going to be awesome, but wager matches aren’t playable offline, there is no personal profile for offline split-screen matches, and there is only 2-player in zombie mode. Also, I think 4-player split-screen online should have been possible, since they already have 2-player. You can probably see that I only like COD for its party play functionalities, but I think that is something Teryarch should focus on, since there are so many casual gamers that love COD and casual gamers always love split-screen with friends. @ Flying_Turkey: Beware the CoD Party System. Your party will tend to be rent asunder. I was playing with one other friend and 3/5 games we played we were on opposite teams, and it was just Team Deathmatch. It’s weird, so be prepared to face off against your brethren. Next Next post: GamerSushi Asks: Games that Grow on You?